If you have read my blogs on Ecover and cleaning (part 1 and part 2) you would know that I am not a cleaning fanatic. I like my house clean and tidy (even though my mother would consider it otherwise), but up until I started using Ecover I hated the smell of most cleaning products. Nearly two years ago Ecover bought out it’s eco-cleaning rival method (www.methodproducts.co.uk) and they now have formed to make the world’s largest company of eco-cleaning products. They share the same ethos and both products and packaging contain ingredients that are not only sustainable but also plant based. First of all I love the packaging, great bright colours and super easy to dispense. 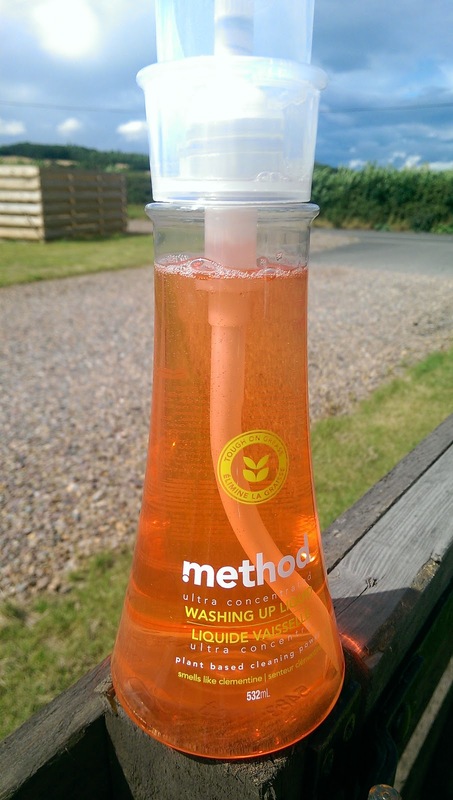 The method Ultra Concentrated Washing Up Liquid comes in a 523ml bottle with a pump dispenser. This looks great at the sink, but is also perfect for when you have mucky hands and makes it easy to dispense into the sink without opening the cap, flipping it over etc. It also has a mechanism to allow you to twist and open/close the dispenser. I found I used the same amount of liquid as I would have done with my old concentrated washing up liquid, in fact we do appear to go through bottles less frequently. It cuts through grease well and the gentle clementine fragrance did not leave a potent smell on any of the dishes/gym bottles. I have since been on line to buy a large refill pack for this. Given the amount of laundry I do I find myself going through detergent quite quickly. Since moving over to the method Laundry Liquid (300ml) I have found I am restocking less often as well. 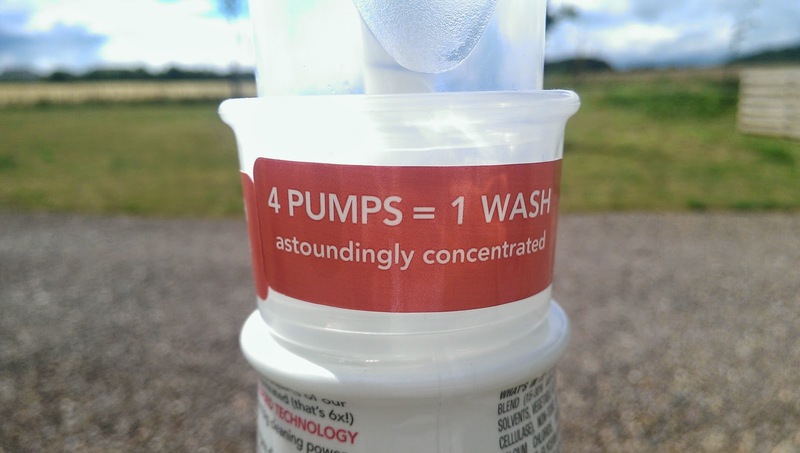 I love the simplicity of the dispenser where 4 pumps is enough for 1 wash. There is less opportunity to spill liquid down the outside of the bottles and generally less fuss. The compact size of the bottle is great in the cupboard and hardly takes up any room. I have used this laundry liquid on all kinds of washes from cold to hot and everything in between including stain removal and the results are good. Peonies are one of my favourite flowers and I adore the smell of this product. As with all method products, the plant based formula is really gentle on my family’s skin. Who would have thought you could effectively clean laundry with a 95% plant based formula. 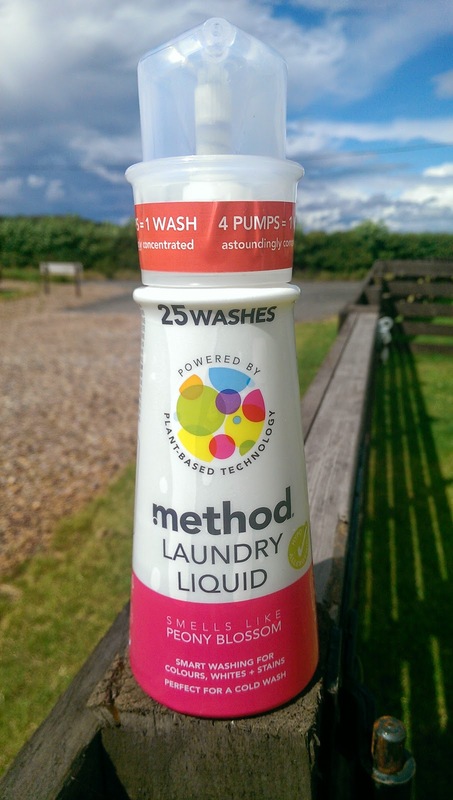 You can also by method Laundry Liquid in a larger refill pack, although not available in Peony currently. The refill packs are really easy to use as well. Great design put into everything they do. 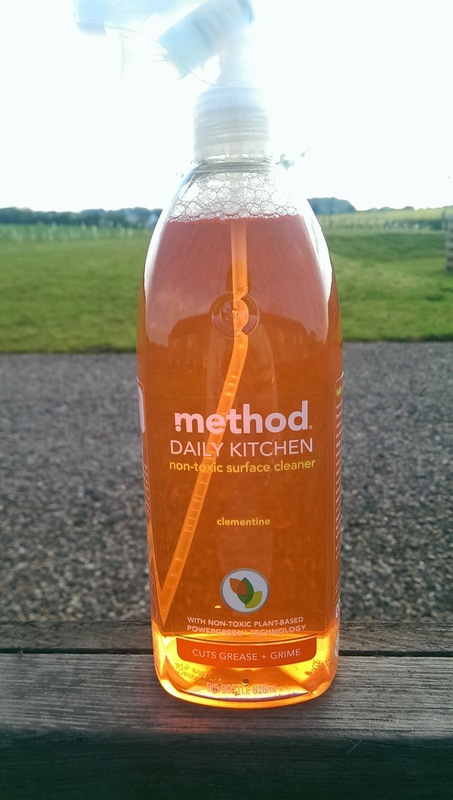 When I first got the method Daily Kitchen Non-toxic Surface Cleaner, I mentioned it to a few friends and said how much I was liking it. Their responses were “oh my god i love that stuff, it smells so good”, ” I douse my kitchen in it” and “amazing how it neuks anything my kids leave behind”. Clearly it has been a hit product in several other households. I often tease Mr Fifi Friendly about his “slight” OCD in cleaning kitchen work surfaces as he hates them to have smears on them. Every time I see him in the kitchen he seems to have a cloth in his hand and is wiping the surfaces down. I am a big fan of non-toxic cleaning, especially around the kids. This product sorts out any spills on the table, work tops, kitchen tiles, even glass surfaces and leaves the surface smear free. Perhaps he is addicted to using this product now although doesnt have to use as often!! The 828ml bottle size has lasted us well and the spray dispenser does not over spray or drip. Quite simply method is an awesome brand. Each of the products I have tried, has proved itself and more against the chemical laden alternatives. They have all earned their place as a staple in the Fifi Friendly cleaning cupboard. 5*Fifi Friendly products.